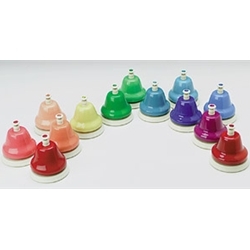 This KidsPlay 13 Note Deskbell Set features bright colors and correct intonation. Sure to be a hit with kids of all ages! Each individual note in the C-c chromatic set includes the name of note and number making it possible to easily play hundreds of songs. Bell section is made of metal for nice clear tone.